In Afghanistan, after years of war, there were many efforts to create a stable system of telecommunications. As of 2016, the telecommunications networks cover about 90% of the local population. Nowadays, mobile communications sector is actively developing. There are 5 GSM operators providing services to a total of more than 25 million people. Mobile penetration in Afghanistan has reached 80%. This opens up great opportunities for voip termination providers to capitalize on terminating the international GSM traffic. 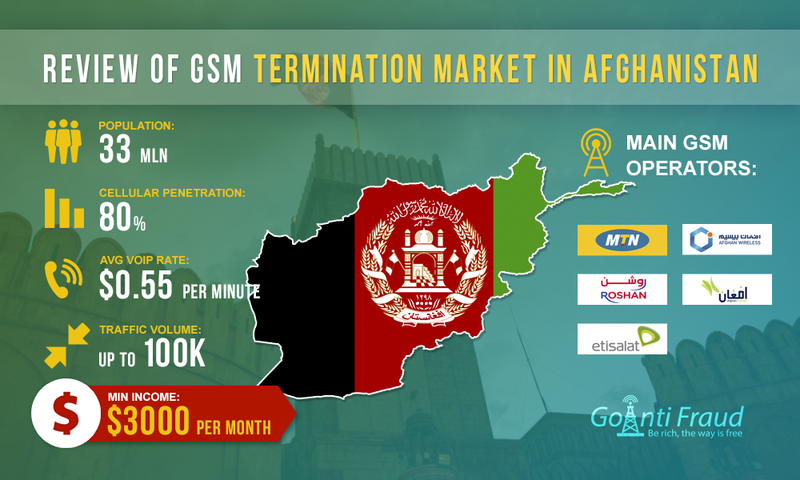 There is high enough demand for termination of calls in Afghanistan. Originator companies are ready to provide live traffic amount of between 60 and 100 thousand minutes. With an average $0.55 per minute, you can get a stable high profit in this country. The main thing is to ensure that your SIM-cards are protected against AntiFraud-systems. Afghan Telecom (3.6 million connections). Boost your business profits in the GSM termination by ordering the GoAntiFraud Corporate Solution! Choose the best package - Start Up, DeLuxe or Ultimate, and get the best opportunity to evaluate all the possibilities of the service! You can also buy GoIP, EjoinTech & ChinaSkyline equipment at low prices. Subscribers have the option to choose a pre-paid package, which will be beneficial to make calls within the country. For example, MTN Afghanistan offers the Talk More tariff providing one minute at as little as $0.0075. SIM-cards can be bought in the local mobile phone stores. The cost of SIM-cards differs, depending on the operator, with Roshan offering the cheapest ones at $5. By placing a 2n gsm gateway or some other to terminate calls and working 5 hours a day in Afghanistan, you can make about $3,000 a month per channel provided the lifespan of SIM-cards is 3 days.